If you would like to be informed in advance of the monthly, annual and fixed flying stars for the rest of your life, maybe consider our advanced flying star software, click on the banner below for more details. I shall explain a little here what Xuan Kong (flying stars) is in order to benefit our readers who are not familiar with it. Please remember this is only the monthly good or bad influence, you can enhance and cure even more by following our annual advice, follow this link for more details. 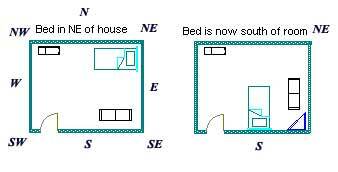 The Xuan Kong (flying star) system addresses the time dimension of Feng Shui of a given property (home or office). This is an analysis of the interaction of elements (fire, earth, metal, water and wood) within the different sectors of the property and how we may enhance the good energies to give us support or suppress the bad energies by keeping them at bay. Every year we put together an annual cures kit which enhances good stars and cures bad stars; these are essential for every home and office. These cures and enhancers kits can be placed at any time of the year. If you are thinking of building a house, this is the time when we analyse the natal chart (flying star chart as below) to determine the best locations for all doors and the allocation of important rooms in order to harness the beneficial distribution of energy. Every property will have good and bad stars; the secret is placing the good stars in places like an office, bedroom, lounge or dining room and the bad ones in places like a bathroom, en-suite, cloakroom or utility room. In Feng Shui terms, the interaction between the energies (good or bad) of each sector of a Xuan Kong chart above will affect the well-being of the household. In addition, this interaction is further influenced by the visitation of the Annual visiting energy that represents the potential influence, as well as the Monthly visiting energy that acts like a catalyst. These influences are experienced in varying degrees throughout the month because of the Daily visiting energy. In every house, there are good and bad palaces which affect our daily lives. How and who gets affected (good or bad) depends on who occupies which area. The objective here is to be aware of the influences and how to capitalise on the beneficial energies or avoid the unfavourable influences either through enhancers or cures or avoidance. Knowing the effects of the influences allows us to take appropriate measures and actions to calm interactions. So, do not get too worried when you come across a bad sector – sometimes with thought, care and the appropriate elements, we can balance any conflict of energies or compensate the lack of an element to bring harmony to a palace. That said, if a palace is particularly bad, avoidance is the best cure. You do not have to run around and try to cure every affected sector of your house. Simply be aware of the potential influences of the sectors. The objective of this update is to prepare you by informing you of the intangible forces of energy that exist in each sector of the house and how these may influence your performance. Please do not panic when you find that your bedroom is located in an affected sector for the month. This is only a temporary influence and can be avoided. If you cannot avoid the room completely, then try to use the good small sectors (tai chi) of the room. There are more details on how to do this towards the bottom of this page. If possible, use another door if your main door is negatively affected this month. If your main door is affected and this is only the door you have in your property, you should take extra care in what you do during the affected month. You will know it may not be a good time to take risks and also to take extra care of your health. Hopefully you would read our advice on cures and enhancers for 2006; if not pleas follow this link for more details. 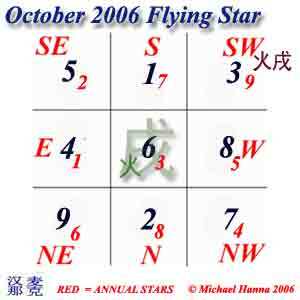 From 8th October to 6th November 2006 is the ninth month of the year of the fire Dog (Bing Xu) with the ruling energy of #6 in the central grid. East – If this is your office or main door, successful business can be made through good networking especially for those who are in the media, PR, creative, promotion and communication fields. Writers and researchers will also benefit from this influence if their writing desk is located in this palace. Encourage those who are studying or involved in academic pursuits or literary challenges to use this palace frequently. A wonderful sector for couples as this is a good sector for building relationships. Marriage may also be a possibility when under this romantic influence of the month. This is also a good sector for those who are preparing for exams. If your bedroom is in this corner of the house, place something blue, e.g. throw over, rug etc, in the north corner of the bedroom. This is a good sector for those who are looking to tie the knot or for whom romance is on the agenda. The energy of the month is very conducive for building long term relationships. You can place your mandarin ducks or rose quartz double hearts here to remind you of this romantic influence. A lovely influence also for those who are in the creative field from writers, artists to architects. If your office or study is in this sector of the house or office, the influence of the sector may propel your ideas into reality. This is the month to work hard and pen ideas into proposals and make use of this wonderful influence for future success. Romance is also dominant in this sector, so for those who occupy a bedroom in this corner of the house and are single, enjoy. This is also a good sector for those who are preparing for exams. West – Although afflicted this year by the annual #5 Yellow, we get to see a peek of sunlight this month with the presence of the monthly #8 white influence. I would still proceed with caution. If there are any aspects of your life that you wish to improve this month place a symbolic object in the west, an example would be if you were applying for a new job, place the application copy forms in the west of your room. If this is your bedroom though you still need to be careful and ensure your annual cures are put in place although it is not as bad as previous months. Make hay while the sun shines. South – Those who have a front door, office or a bedroom in this sector of the property, may find fame and recognition this month. Possible joint ventures or new business plans may appear when least expected. To enhance this month place a brass Dragon here or a metal wealth pot. To enhance family and romantic relationships place a wooden Wu lou along with a brass Dragon headed Tortoise if you have one. Beware of possible headaches when over worked so pay good attention to your health. Drink lots of water, no matter how busy you are, as dehydration can cause headaches. Take time off to rest your eyes from the computer screen to avoid migraines. Sectors to be aware of this month. Southeast – The monthly 5 Yellow has flown into this southeast palace where the annual #2 Black resides. The combination not only denotes illnesses and constant poor health, obstacles and difficulties in endeavours but also threatens break ups in relationships, divorces, lawsuits and emotional and nervous breakdown. My advice is to be very careful with the southeast palace in the month of October. Do not undertake any form of renovation, hammering nails or drilling in the wall, or disturb the earth with digging work for ponds, wells or swimming pools. Working with any noisy equipment in this area is also not advisable. For those using our monthly cures kit place your Wu Lou here along with six Chinese coins tied in a row with red ribbon to weaken the #5 sickness and bad luck star. Avoidance is the best cure for this combination of qi. If you cannot avoid using this room, make sure that metal cures are in place. Use metal such as gold, copper or brass. You can use whatever metal objects you have got handy in your house but do avoid objects that are sharp or menacing looking. Do not place any red, pink or orange colours in this area or anything triangular or square in shape. Moving metal objects such as gongs and bells are very effective remedies. Instead of using metal objects, you may also use the salt water cure. Objective metal symbols such as golden Wu Lou, tortoises or 6 ancient Chinese metal coins tied in a row are also good cures. If the kitchen is here, beware of food poisoning and illness associated with the stomach and abdomen. Place hygiene at the top of your priorities and be extra careful as to the source of goods bought and their preparation. On the other hand, if the southeast sector of your home is where your bathroom, cloakroom and utility room are, you do not have to place any cure. Just keep the area quiet and keep the door closed. Do not disturb the ground in the southeast part of your garden this month or conduct any noisy renovation in the southeast sector of the house or office. The negative aspects of the visiting monthly #5 Yellow can bring obstacles in business or at work as well as illnesses affecting the ears, kidneys and inflammation of the bladder. If you already have metal enhancers for the annual 2 in the southeast palace, this would be the appropriate cure for the visiting 5 Yellow. If you have not, I would suggest placing some metal decorative objects (nothing triangular in shape, sharp or menacing looking) in the southeast corner of the room. If you use our monthly cures kit you should place a Wu Lou along with six Chinese coins tied in a row with red ribbon this month, this will weaken the negative earth element. You would be well advised to refrain from using red in the general décor for the month. Place some blue items instead to calm the fiery interaction. Northeast – Headaches and lung problems are prevalent if your office or bedroom is located here. As such, you should take extra care with not being overstressed or overworked. If the kitchen is located here, be wary of fire hazards. Make sure the stove (hob) is turned off completely after cooking and before leaving the kitchen alone. If your living room is here, do not leave lit candles unattended and keep matches and lighters out of children’s reach. If you have a main door in the northeast place a dark blue or black doormat to weaken this area in October. Northwest – The elements in this palace are also in conflict and this may bring about emotional setbacks. You may feel cheated which will set off arguments and outbursts. Couples should exercise control. In doing so, you will have succeeded in manipulating the energies of your living space to your own benefit. Keep some blue in the décor to help to calm interaction. North – Minor illnesses are indicated when the monthly 2 Black visits the palace. This will affect young males in particularly. Residents of properties sitting or facing the north – southeast axis may be more prone to illnesses this month. Do take extra care with health and diet and make sure that both children and adults are dressed appropriately according to the weather. If this area of your home is a bedroom, front door or office and you use our monthly cures kit place your Wu Lou here along with six Chinese coins tied in a row with red ribbon to weaken the #2 sickness and bad luck star. Make sure that there are no external ‘poison arrows’ in this location of the property or building as this malevolent configuration can aggravate the situation further. If external ‘poison arrows’ are found in this location, you can hang a Ba Gua mirror outside of this location to deflect the Sha qi. Place some blue items (e.g. a vase, cloth, bed cover or rug) on your desk or use blue or wavy pattern beddings on your bed. I hope you find this October update useful in keeping you informed of which sectors are potentially influenced by positive or negative qi. Please remember this is only the monthly good or bad influence, you can enhance and cure even more by following our 2006 annual advice, follow this link for more details. The cures and enhancers for 2006 can be placed at any time of the year. If you would like details on a traditional and authentic Feng Shui consultation on your home or business, you can either visit consultations or email us on consultations1@fengshuiweb.co.uk or phone 01296 399100. If you are unable to move to another room for the month, make sure your bed or work/study tables are in a more beneficial area for the month. Example: If you or your child are in a bedroom in a bad area of the home this month, get your compass and stand in the centre of your room and place the bed or desk in a more auspicious area for the month as mentioned above. I know it is easier said than done but moving out of a room that has temporary inauspicious qi is worth it. This is so especially with health issues provided you can afford the space and rooms. If you cannot, do not fret. The effect can be minimised by relocating the bed or study/work/office table to an auspicious sector (follow example above) of the room or placing cures as recommended on this site. As I have said before, this is a monthly influence and so it will pass. If you would like to know how to avoid potential problems in 2006, please click here or the link below.